After a member of the Splitters Ck-Bungowannah Landcare group visited the Lake Hume glider project site we were asked if we could talk to their group about what we had been doing. Hopefully sharing around what we have done will allow other groups to learn from our experience. The invitation was accepted on the condition someone from Baranduda also attended. nestboxOn the evening of Thurs 23 May 2013 Stuart Lucas (Woolshed Thurgoona LC) and Ron Herbert (Baranduda LC) attended the Splitters Ck-Bungowannah LC AGM. We heard what the Group had been up to over the last year or so, including some great stuff. Stuart summarised what his family had been doing on their block, how the “Friends of the Lake Hume Gliders” project had started and the activities and findings to date. 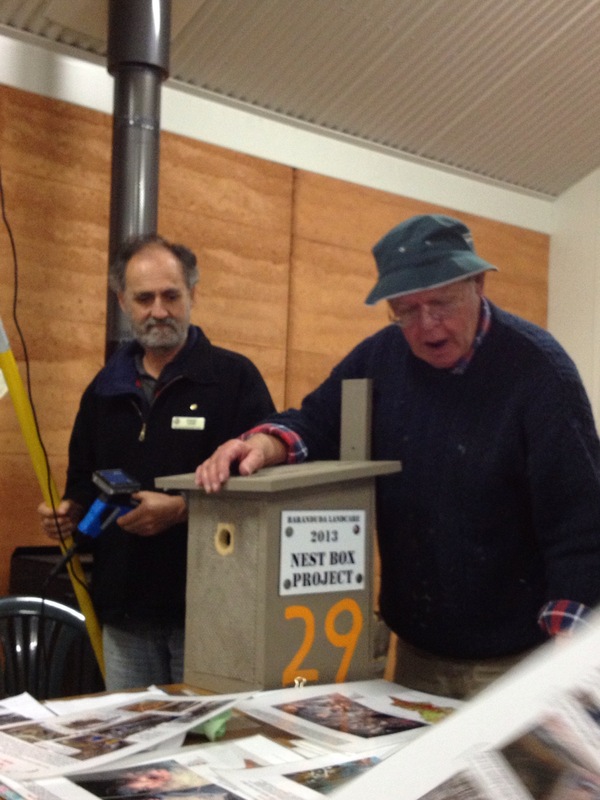 Ron spoke about nest boxes, their use and design and shared some pictures around. The use of monitoring pole camera was also described and demonstrated. It was a great evening finished with a cuppa and sweet nibbles. Feedback was very positive and we have a couple more emails addresses on our glider friends list.